Taiwan’s Ambassador to Belize, H.E. David C. K. Wu, and Financial Secretary Joseph Waight this morning penned two bilateral agreements at the Embassy of Taiwan in Belize City which the parties said would deepen their cooperation in Information and Communication Technology (ICT). The first agreement, signed in both Chinese and English, extends an earlier agreement signed on the occasion of a state visit to Belize by Taiwan President Ma Ying-jeou. The Ambassador said that there are no new terms to the extension agreement, which makes the ICT cooperation agreement, due to expire May 2014, valid for another five years, until May 2019. In concert with the signing of this bilateral agreement, the parties signed a second agreement for the implementation of a new project, which would see the introduction of the Belize Electronic License and Permit System (BELAPS) initially across 6 government agencies: the Belize Bureau of Standards, the Agriculture Department, the Belize Agricultural Health Authority (BAHA), the Forestry Department, the Fisheries Department, and the Customs and Excise Department. Speaking with Amandala after the signing, John Robateau, Systems Analyst at Central Information Technology Office (CITO), which oversees the Taiwan-funded Belize National ICT Center in Belize, said that under the new system, the agencies identified, which require some type of permit for commodities to be imported and exported, will require the public to process their applications through a new electronic system. Robateau said that this is just the beginning of what they envision to be a government-wide overhaul, which may span another decade. The reform, he said, would apply to agencies which provide licenses and/or permits from the Government. Ambassador Wu said this second agreement formalizes cooperation between the ICT Center and Taiwan’s Technical Mission in Belize. Under the agreement, which took effect at this morning’s signing, the Government of Taiwan will offer $3 million over 5 years. The Government of Belize will provide counterpart funding of $640,000. Wu said that the efficiency and transparency of the six government agencies should be greatly improved. Ming-Cheng Tsai, Project Manager for the ICT Belize Project, told Amandala that coordinating with different agencies of the Belize Government, to engage them in dialogue on how the project should proceed, has been a challenge; however, work is progressing. He echoed Ambassador Wu’s words, that this new agreement should build a foundation to bring better e-government systems to Belize. 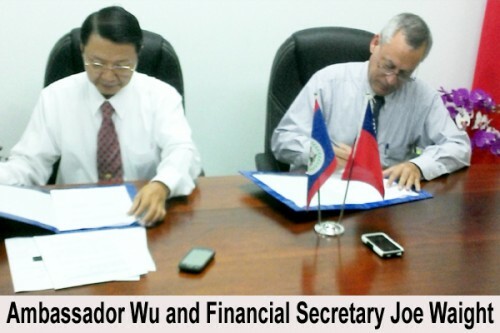 Following the signing, Financial Secretary Waight thanked Taiwan for its continuing support and assistance to Belize. Waight said that the project is yet another instance of “the warm and friendly relations” between the countries. He added that the project will help Belize utilize the knowledge and expertise being offered by Taiwan. Waight said that one of the commitments, on the part of Government, is to provide counterpart funding and to eventually take on the project, which, he said, would provide a new window of service to the public. He said that the commitment on the part of the Government is to run and operate the system, once it has been implemented and established. Taiwan established the Belize National ICT Center in 2010. Ambassador Wu said that the Center has become a hub for three very important purposes: the development of information and communications technology for Belize; the enhancement of Government’s administrative efficiency by setting up e-Gov systems; and capacity-building through training of 827 government employees, who, he said, have received 1,162 hours of training at the center. Ambassador Wu pointed to future collaborative projects, such as an online system for vehicle licenses.